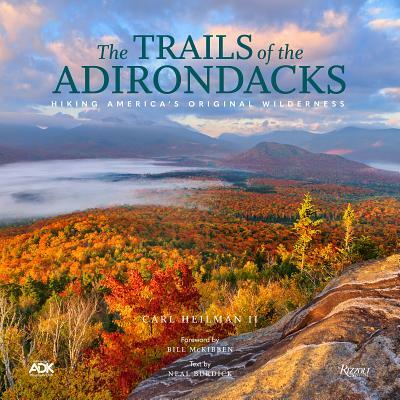 This official book published with the Adirondack Mountain Club celebrates America's original hiking destination through breathtaking contemporary photography, maps, rarely seen archival photos, and a text that brings the history of the trails to life. The Adirondack Park is home to the largest protected natural area in the lower 48 states--six million acres including more than 10,000 lakes, 30,000 miles of rivers and streams, and thousands of miles of hiking trails running from mountain summits through a wide variety of habitats including wetlands and old-growth forests. How better to view this wilderness than afoot on the many trails, many leading to some of the most picturesque summits in North America. There are trails for everyone in the Adirondacks. Today, thousands enjoy hiking, skiing, and snowshoeing trails to backcountry destinations all around the park while others aspire to climb all 46 peaks. Water trails include the historic Fulton Chain of Lakes, Raquette River, and Saranac River routes, in addition to more intimate paddles across wild lakes and waters that meander through towering mountains and verdant forests. Every season has its own charm, all portrayed here in this one of a kind volume of history and photography along Adirondack trails. This is a book for anyone who enjoys travelling through the Adirondack backcountry and includes unique and picturesque destinations throughout the Adirondack Park in addition to a comprehensive history on hiking in the Adirondacks. From the dramatic beauty of the Lake George Wild Forest, to numerous fire tower summits and open ledges and mountaintops scattered around the park, and the rugged splendor of the High Peaks and bucolic beauty of the Champlain Valley, this book covers it all. Carl Heilman II has spent the last 40 years hiking and photographing his beloved Adirondack Mountains. His photographs of the region's incomparable grandeur and beauty continue to be published in magazines such as Outside and National Parks, and presented as shows on PBS. Heilman's images qualify him as one of the premier ambassadors to the areas mountains and waterways. Bill McKibben is an environmentalist and writer who frequently contributes to The New York Times, The Atlantic Monthly, and Outside. Since 1922, the Adirondack Mountain Club (ADK) is the only nonprofit organization dedicated to protecting New York State's wild lands and waters.